sun is using Smore newsletters to spread the word online. Clinical and patient safety is undoubtedly the main target for successful healthcare programs. The use of specialized equipments to maintain sanity and prevent the possibilities of infection has been considered as the prime parameters of medical industry. Sterilization is in turn is focused on serving with safety and sterilization equipments have been considered the most mandatory of all to support the above purpose. It is another definition for maintaining hygiene in the equipments which are used for treatment and diagnosis purposes. As far as sterilizers are concerned there are varieties of medical industry branches which deserve the presence of cleaning equipments including, medical devices and surgery equipments, glassware, linen, cotton, gauze and gloves, etc. The concept of disinfectant is highly preferred for in healthcare Sun Sterifaab presents Autoclave, a versatile sterilization and disinfectant device designed to perfectly support multiple aspects of medical sector. It stays cost effective equipment applied to purify range of medical products like containers, vessels, glass wares, rubber products, instruments used in operation theatres, etc. Dry heat sterilizer is another significant purifier which stays very helpful in drying medical equipments especially those that are applied in surgeries, esthetic laboratories, etc. It can hold products which can withstand high temperature and suits best for decontaminating dental instruments, sharp surgical instruments which can possibly attract moisture, a major threatening factor for infection. There are certain products like plastic container, electronic components, catheters, etc which are applied for medical purpose yet cannot be purified in high temperature purifying equipments can be can be sanitized with the help of ETO sterilizers. It maintains moderate temperature in the same level. Steam sterilizers are the most commonly used form of purifying equipment which serves medical industry with several aspects. It helps in obtaining increased results at minimal time and less operation cost. Above all, it is absolute environment friendly decontaminating equipment. Hot water shower sterilizer helps to maintain sanity of plethora of products starting from glass containers to flexible plastics, injectable products including syringe ampoules, plastic metering containers, etc. It is an exclusive equipment used for rigid, flexible and semi-rigid plastic and well as plastic containers. Purification is not just related to health care and pharmaceutical industries. Other industries including food and beverages, laboratories, bio-technology, etc also has a high demand for decontaminating equipments. 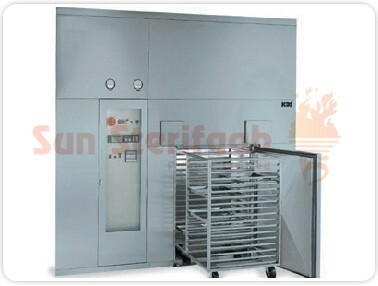 Sun Sterifaab provides wide range of sterilizers to fulfil the purification requirements of several industries. Sterilizers are applied highly in medical industry as they help to maintain the sanity and prevent the possibilities of contamination. There are variety of equipments exclusively designed to serve the above purpose are designed for wide range of purification purposes.